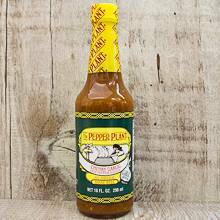 This popular hot sauce from The Pepper Plant is jalapeno-based with chunks of local garlic. For seasoning and cooking - excellent with tacos, roasts, stews, hamburgers, steaks, beans, meatloaf, soup, egg dishes, spaghetti sauce, and Bloody Marys. Net Wt. 10 oz. Ship Wt. 1.5 lbs.